It was a very cold and frosty Sunday morning as we hurriedly made our way from No.6 Church Street (Stryd-y-Llan) up towards the Square (Y Groes) in Nefyn. I was nine years old at the time, too young for long pants, and my bare knees were cold as I struggled to keep up with the longer strides of my father Lawrence Owen and elder brother Mike. The heavy hobnail boots on my feet did not help either. It was 4:30 am and my mother got up real early to start the coal fire in the grate (an usual morning ritual) and to prepare us three cups of hot oxo before setting us on our way on to the cobblestone pavement outside our door. My father was a fisherman, and we were on our way to meet two other local fishermen, Glyn and his brother Gwilym Jones, on Nefyn Square at 4:30 am, before heading for the herring nets. Winter herring fishing was just one of the exciting experiences I had as a child growing up in Nefyn. The town had an illustrious record of being the Herring Capital of Wales, with records going back over several hundred years. Nefyn had “Three Herrings” on its coat of arms which it proudly displays to this day, and the sailing ship on the tower of the old Church just down the road from our house was very much the symbol of a seafaring community. Nefyn even had a field shaped like a herring, clearly visible in the Ty’n Coed Valley when viewed from the top of Garn Boduan, the mountain behind the town. The town had several families whose ancestors had a rich heritage in the herring fishing traditions. The place was awash in stories, especially among the older local fishermen, of herring being caught by the thousands, and even being used as fertilizer on the farmer's fields. The herring catches had subsided significantly since the 1920’s, but several fishermen still continued to practice the local herring fish	ing techniques. I was all excited on Saturday when my father indicated we were going to set herring nets in the afternoon. This was going to be my first time, and, weather permitting I was even going to be allowed to check the nets early on Sunday morning as well. The five of us spent the entire Saturday afternoon laying the herring nets on Nefyn beach. My father had pulled out four of his nets from the wonderful-smelling, burlap bags they were kept in over summer in the corner of our beach shed. Two were shallow water nets, and two were deepwater nets. 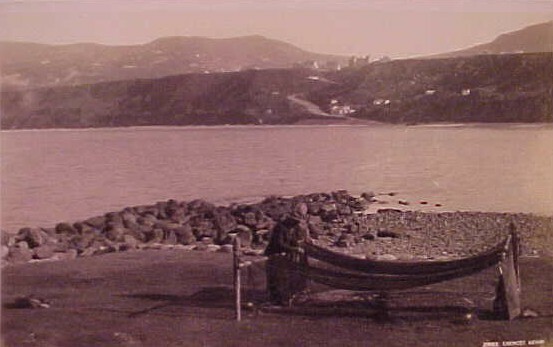 The nets were laid out on the herring poles that used to dot the landscape in that corner of Nefyn beach. They were checked and repaired for any damage that mice might have done to them over the summer. Glyn and Gwilym likewise had three nets also ready to go, two deep and one shallow-water net. Lawrence Owen on Nefyn beach with "Swanings" just beyond the boats at sea. The tide was fully out around 4:00 o’clock that afternoon. The three shallow nets were carried on a gurney my father had for his draw-net (another story) along the beach to the bottom of Screw Road (Lon Gam), a road that zigzagged down the cliff on to the beach. Carrying the nets was heavy work. The nets had grooved stones attached to them every two feet or so along the lower edge to keep that edge of the net towards the sea bottom. The upper edge had a string of corks to keep that edge floating near the surface. The nets themselves were made of a heavy brown fibrous cotton twine. The gurney had two handles at each end, and between the five of us we made quick time of the relatively short distance directly across the beach at low tide. While my father and Glyn returned with the gurney to take care of the deepwater nets, Gwilym, Mike and myself meticulously laid out the three nets on the beach. The nets were tied end to end, and they reached all the way from the low water mark to the high water mark. There was an anchor at both ends, and the anchor at the high water mark was buried in the stones by the breakwater underneath Huw Bryn Beuno’s Café at the bottom end of Screw Road. Meanwhile, at the other end of the beach, Glyn and my father loaded the four deepwater nets on the gurney on the stern of our old M155 rowing boat. They rowed the boat out to the “Swanings” as it was locally called, an area in the sea about 300 yards off shore just to the northeast of Nefyn point. There they carefully laid out the four nets as the boat slowly drifted with the slack tide, again tied end-to-end with one large anchor at the seaward end and a buoy at the other end. One end of the net in deep water was allowed to drift with the tide in part to minimize damage from seals and bigger fish that chased the herring shoals. Returning to shore, the old boat was secured, ready for use the following morning, and the five of us sat down for a quick cup of tea from the Calor gas stove in the corner of the beach shed. These “sit-downs” or get-togethers among the locals in the beach sheds were always entertaining, especially if some of the older fishermen like Captain Richard Hughes (Dic Ffani), Captain John Jones (John Gongl), Captain Richard Lloyd (Dic Lloyd), or Captain Baum were present. These four were retired sea captains from the days of the old sailing ships, and they were just full of entertaining stories about their world travels, local fishing experiences, and ghost stories. A pity some of those stories were not recorded, they were just fascinating. It was getting dark, and we quickly finished the tea, and made our way back along the beach. The tide was now coming in rapidly, and half the nets on the beach were already underwater. Everything looked fine as we climbed up Screw Road and headed back home to 6 Church Street. We made arrangements with Glyn and Gwilym along the way to meet the following morning on Nefyn Square. It was a little past 4:30 am on Sunday when we turned the corner on to Palace Street (Stryd-y-Plas) by Plas Bach at the top of Church Street. Plas Bach is where Nurse Jones lived. She was an exceptional lady, the local area midwife and nurse. She drove around Nefyn in her little black Austin Seven delivering babies, treating the sick, providing medicine from her own dispensary, and all with no charges for her service. Most people preferred Nurse Jones to the local doctor, and a whole generation, now in their 60’s and 70’s, owe a lot to her efforts. For the local children, of course, the stork never flew into Nefyn. Babies came specially delivered by Nurse Jones in her Austin Seven all the way from Carreg Lefain (Crying or Echo Rock) a small mountain above Nefyn. We proceeded up Palace Street to the Square. It was not a particularly dark night. The moon was not full, but the moonlight and the heavy frost combined to brighten up the whole night landscape. Even the road was frosty white beneath our feet, and our footprints were clearly visible. We walked quickly in almost total silence, trying not to wake anyone, especially since it was a Sunday morning. Sunday was a day of worship in Wales in the early 1950’s, and everyone was expected to attend the local Chapels or Church. Any kind of work related activity was frowned upon, even just going to old Mrs Ellis’ shop to buy the Sunday newspaper. Going fishing of course was beyond the pale. As we entered the Square, Glyn and Gwilym came down the High Street (Stryd Fawr) to join us. After a quick half-awake hello, the five of us moved briskly up Tower Hill, past the new church on the right, the Nanhoron Arms Hotel on the left, and past the War Memorial along St. David’s Road. Turning towards Screw Road, away from the close vicinity of houses, the conversation became a little louder, and was totally focused on our netting prospects. The lack of a full moon was certainly going to bring the herring inshore, and with hardly any phosphorescence (mordan) in the water, our prospects were good. Little did we realize at that time what the night still had in store for us. Deepwater herring nets on Nefyn beach with Screw Road across the bay. As we turned the second corner on Screw Road and the beach started to come into view, Gwilym was the first to remark that the nets on the sand were full of fish. He had very good eyesight. The pace naturally quickened, and after turning the third corner it became very evident to us all. There were hundreds of herring in those nets stretching all the way from the high water mark right down to the waters edge. When we got on the beach itself, we were all shocked to see how many fish were caught. Glyn and my father gave us quick instructions on how to get the fish out of the nets, while they headed for the beach shed and the boat to get the nets from the “Swanings”. The procedure was to hold the fish with one hand and lift the netting mesh out of its gills and over its head with the other. It was very hard, “bending-over” kind of work, with cold freezing hands, and fish scales everywhere. Once removed, the herring were thrown in little piles on the beach alongside the net. The three of us must have been at it for an hour before Glyn and my Dad bought the M155 ashore at our end of the beach. They had only one net in the boat, and it was packed solid with fish. They did not want to risk swamping the boat with too many nets, so they chose to make several trips. The grey seal (morlo) was out there too according to Glyn, filling his belly with easy-to-catch fish. Glyn had intentionally hit it in the head with an oar, but that was no deterrent. The seal just continued to eat the fish, right by the side of the boat, leaving only the herring heads in the net. The seal was a potential danger because, with the net half in the boat on its broadside, he could easily swamp the boat if he got tangled in that part of the net still in the water. Glyn muttered something about having his rifle with him next time. My father asked Mike to go back home quickly and bring down the old black pram my mother had used for my younger brother Terry, who was now nearly three years old and did not use anymore. The pram would be ideal for carrying the herring along the sand, and ideal it was. To make a long story short, the pram went back and forth, back and forth, and up and down that beach many, many times, full to brim with fish. We had to work quickly since the tide was now coming in again. I was put in charge of the pram, and my job was to lift the piles of herring off the sand, into the pram, and get them off the beach. The herring were all dumped into one massive big pile by the wall underneath the fresh water outlet that ran beneath Screw Road just below Huw Bryn Beuno’s Café. There was plenty of fresh water running out of that outlet in those days, and it was ideal to wash the scales and sand off the fish. I never worked so hard in all my life. With the nets coming ashore from the “Swanings”, and with Glyn and my father joining in, there were ample piles of herring for me to wheel away. My father went up to Nefyn around 8:00 am to wake up Jack Pen-y-Graig who had a lorry and plenty of burlap sacks to load the fish in. He came back with Jack and we proceeded to load up the sacks with fish, counting them as we went along. We could get about one hundred and fifty herring in a sack and still be able to lift it, but we soon abandoned the counting, resorting to estimating from the height of the sacks how many fish were in there. I vividly remember Glyn, Jack, and my father lifting those sacks on to the lorry at the bottom end of Screw Road. My recollection was that there were about sixteen bags for a total of approximately two thousand four hundred herring to split between the Owen and Jones families. I remember my mother saying that I needed a bath when I came home around 10:00 am that Sunday morning. My clothes were covered in fish scales, and the scales were up my nose, in my ears, and thick in my hair as well. I don’t remember having the bath, but I am sure I did. With no bathroom or running hot water in the house, a bath was a grueling procedure of boiling water on the coal fire, and using a metal tub right in front of that fireplace. We had to wait until Monday morning, New Years Day 1951, before we could go out to sell the herring. Word soon spread throughout the town and surrounding area that there were herrings for sale at No 6 Church Street and at the High Street address where Glyn and Gwilym lived. And splendid herring they were too, typical apparently of the famous Nefyn variety, heavy and fat with a nice mix of both the soft and the hard egg roe. People were flocking to the door to buy them, and they were sold for a paltry shilling a dozen (swllt y dwsin) - just a penny each. Those days were the tough days after the war in Britain, and the poverty in some of the rural communities in Wales at the time was very real. So a fish catch like this was a welcome help to everyone in the community, and almost every household took advantage of it. It reminded the Nefyn elderly of the days in the early 1900’s when herring catches of this magnitude were fairly commonplace. My mother took a couple of dozen to my grandmother in the Fron since she loved to pickle the herring in her old earthenware pots. She also took some to her farming relatives down the Lleyn Peninsula in Llangwnadl, Sarn, and Pen Groeslon. I haven’t eaten pickled herring since those early days, but the memory of that delightful taste remains with me to this very day. Those old folks certainly knew how to take advantage of a good thing. The herring were all gone in no time. To my knowledge, that was the last great herring catch at Nefyn. My father and several other fishermen would continue for years later to catch a few dozen, even a few of hundred, here and there, but nothing came even close to that herring bonanza on December 31, 1950.